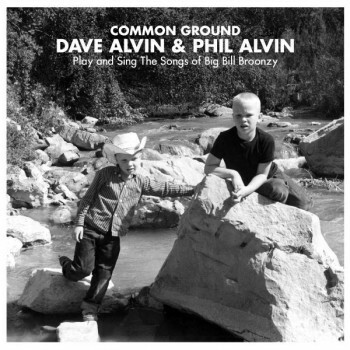 Dave Alvin and Phil Alvin earned a GRAMMY® nomination for Best Blues album yesterday for their widely acclaimed Common Ground: Dave Alvin + Phil Alvin Play And Sing The Songs Of Big Bill Broonzy. Their first album together in 30 years, “the brothers shine” (New Yorker) on Common Ground: Dave Alvin + Phil Alvin Play and Sing The Songs Of Big Bill Broonzy, which heralded high praise from press including, “rare and special” (Hollywood Reporter), “blew our minds” (Wired), “A joyous, loving tribute” (Electronic Musician), “Akin to Dylan on steroids” (Uncut). “We argue sometimes, but we never argue about Big Bill Broonzy,” says Dave Alvin when explaining why he and brother Phil were inspired to record the album. The Alvin brothers, who founded seminal early LA punk roots band The Blasters in 1979, have shared a fascination with Broonzy since childhood. After an illness nearly took Phil’s life in 2012, they resolved to return to the studio and pay tribute to the blues legend. Common Ground includes 12 songs that capture a 30-year cross section of Broonzy’s canon, performed by the Alvins’ in their signature style of rollicking roots and stomping country blues. The 57th Annual GRAMMY® Awards are set for Sunday, February 8, at the Staples Center in Los Angeles.